Mar - 25 | By: Robison | no comments. So, I entered my new short film, The Bag in to the Tupelo Film Festival (TFF). That’s right Tupelo Mississippi. I had heard good things about TFF and when it came time to enter film festivals I thought why not Tupelo. After all it is the hometown of Elvis Presley and since the writer/star of The Bag was Elvis’ leading lady in The Trouble with Girls maybe TFF would find a little extra interest in the film. Fast forward about 5 weeks and I haven’t heard anything back from Tupelo other than acknowledgment that they received my screener. Then all of a sudden I get an e-mail from them. 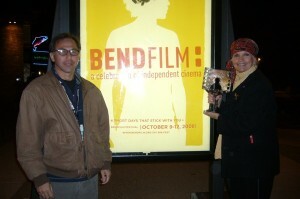 It simply contains a link to a recent Livability magazine (e-zine) article called “The 10 Best Small Film Festivals”. No surprise that Tupelo was on that list. Why shouldn’t they brag. But what did surprise me was that in this selection of non-major film festivals from all around the country two of those that made the list were from Oregon, the Salem Film Festival and Bend Film Festival. Being a Southern Oregon filmmaker I was very pleased at this especially since I’ve had films in both of those festivals. and could I ever go on about the staff and volunteers. They are wonderful! What I really appreciate is that they cater to the filmmaker. Most independent filmmakers are stretching their budget just to make it to a film festival and when that festival can provide them with lodging and great food and drink at festival gatherings it helps a lot and is greatly appreciated. One thing I know about the festivals on that “10 Best” list is that they all have supportive communities both in the form of volunteers to take tickets or put up posters and businesses that are willing to donate services and products to the festival. In the past 5 years I’ve had films in six Oregon film festivals and like I mentioned earlier those include the Salem Film Festival and Bend Film Festival. My short film Model Rules won the “Northwest Emerging Artist Award” in Salem and in Bend it won “Best Actress” for its star Marlyn Mason. We parleyed that success into raising $30,000, most of it from out of state, to make our next short, The Bag. So in just a few years I’ve gone from being an independent filmmaker spending my own money to make micro-budget features like Sixes and the One Eyed King for $10,000 to one who bringing in money to the state for film production. Granted $30,000 isn’t much but it represents tremendous growth that has come about due to the support of Oregon Film Festivals. I’m looking forward to the day when I bring a multi-million dollar feature length project in to the state. I know it is possible as long as the communities continue to support independent film production and film festivals and as long as Oregon film festivals continue to support Oregon filmmakers. One final note; The Bag did get accepted to the Tupelo Film Festival and one week later was accepted in to the Riverside International Film Festival in California.